This is the terrifying moment a truck ploughed into a gas station, causing a huge fireball. It all started with a large red Chevrolet pickup truck crashing into a car in traffic. A female witness can be heard in the video describing how the driver of the red truck ploughed into the back of the stationary vehicle before taking out a lamp post and finally hitting a car that was refueling, causing severe damage to one of the pumps before it exploded. The incident happened in Wayne, a city within Wayne County, Michigan. 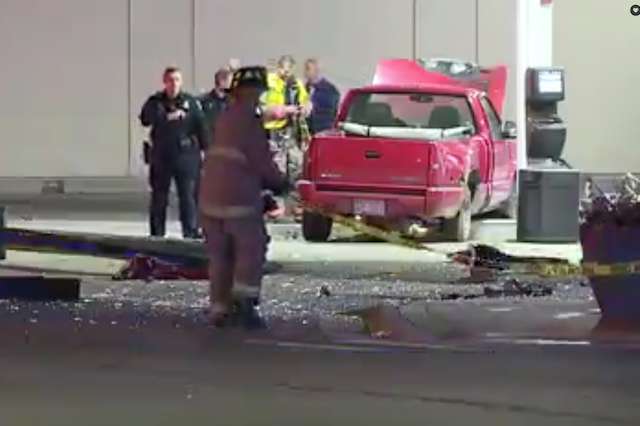 According to a report by 7 Action News, the local police department is still investigating how the crash occurred. The reporter for the news station can be seen standing with the remains of the pump, showing how ferocious the fire was.